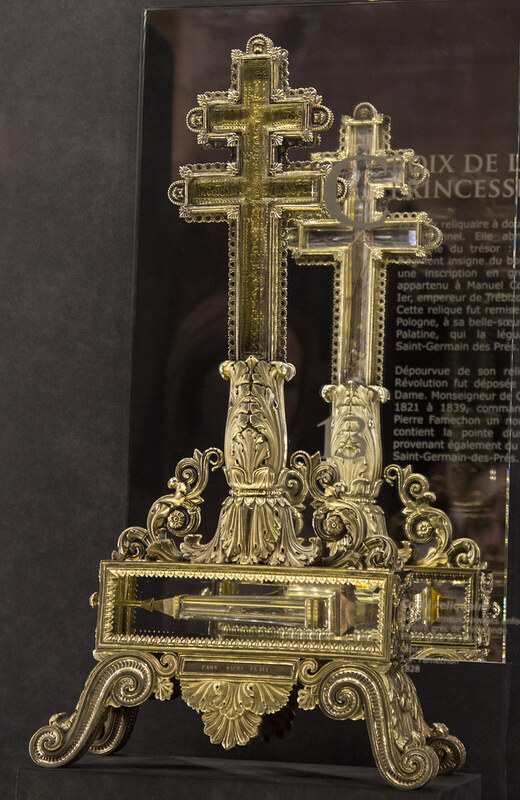 Among the most revered relics of the treasury of Notre Dame Cathedral in Paris is a reliquary cross that contains a small piece of the true Venerable and Life-Giving Cross of Christ. This reliquary is said to have been originally a gift of the Roman Emperor Manuel II Palaiologos (1391-1425), one of the last emperors of Byzantium, to Poland, and from Poland it went to France. However, based on more reliable evidence, it was likely made in memory of Emperor Manuel I Komnenos (1143–1180). The evidence shows that this relic went to Galician-Volhynian Rus’ probably with Princess Euphrosyne, daughter of Roman Emperor Isaac II Angelos (1185-1195; 1203-1204), who ca. 1200 became the second wife of the Grand Prince of Kiev Roman Mstislavovitch (1152-1205). Nailed to the cross he exalted human nature. So writes Manuel Komnenos the Crown-Bearer. Besides this, the dating of the inscription is the late 12th–13th centuries, and the enamel is dated to before 1204. Evidence further shows that King Casimir III the Great of Poland received this cross as part of the loot after Polish troops seized Lviv in 1340. Together with other valuables of the Galician-Volhynian treasury the cross was brought to Krakow, Poland. Before the late 17th century the reliquary cross had been in Poland, in the royal treasury of the Polish-Lithuanian Commonwealth. When King John Casimir of Poland (1609–1672) abdicated his Polish throne, he went to France, taking a number of particularly precious relics from the treasury. Upon his death in 1672, Anne Gonzaga (1616–1684), who was known as "Princess Palatine" as the wife of Edward of the Palatinate, inherited the cross from John Casimir, and this is how the cross became known as the "Palatine Cross". She gifted the cross to the Abbey of Saint-Germain-des-Prés in Paris, the oldest and most revered Christian cloister in France. The Polish Seim and the new king Michal Wiśniowiecki tried but failed to get the relics returned to their homeland. After the French Revolution, the relic came to reside in the Cathedral of Notre Dame, where it was kept in the treasury and continues to be among the most precious relics there, together with the alleged Crown of Thorns. 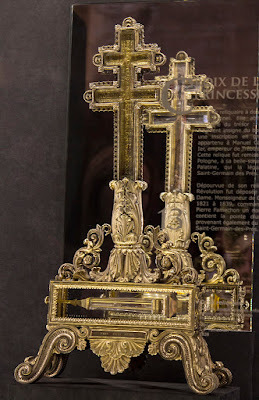 When the great fire broke out that destroyed much of Notre Dame, on 15 April 2019, the relics of the treasury, including the cross, were saved. It should be noted that according to legend, the sanctity of this cross was once tested by having been preserved intact in a fire so intense that the glass and gold setting were melted. This time it was preserved with the help of brave firefighters.